Doctor Who's first televised Old-West adventure since the First Doctor's The Gunslingers is far less fun but no less enjoyable. The drama regarding The Pond's home life is forgotten as we get a parable on the nature of mercy and revenge. Good stuff, all around. 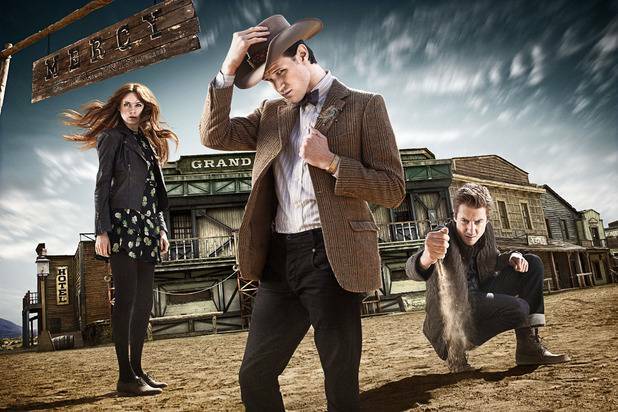 The Doctor and The Ponds find themselves outside a town called Mercy - located somewhere in the American West, post Civil War, some 200 miles north of Mexico. Despite this, the town has electrical lighting some 10 years too early. It also possesses an odd boundary of wood and stone just outside the town gates and an insular, unfriendly population on the lookout for "the alien doctor". Saved from a cyborg gunslinger by the town Marshall, the party discovers that "the alien doctor" isn't The Doctor but Kahler-Jex - an alien stranded on Earth after his ship crashed, who decided to use his advanced technology to help the people that took him in, becoming the town doctor. But Jex has a dark past - one that has brought the cyborg Gunslinger to Mercy and trapped the people in their homes. Ready to condemn Jex until the hypocrisy of his doing so is pointed out to him by Amy, The Doctor must make a fateful decision about who he will stand with and who deserves his mercy. * Toby Whithouse's script draws a lot of parallels between its' three main characters - The Doctor, Kahler-Jex and The Gunslinger. The parallels between the first two are so obvious as to be over-stated: men of science who took on a healer's name, both of whom have done horrible things to prevent what they saw as a greater evil at the time. Far subtler are the parallels between The Doctor and The Gunslinger - two angry men forever changed by war, who see themselves as monsters, desperate to bring about something positive with whatever time they have left. This symbolizes the main conflict of the episode - The Doctor's own internal conflict between his conflicting desires to be both the shield of the weak and the sword of vengeance. * Matt Smith carries off his role beautifully, playing The Doctor across a wide range of emotions. His anger in the face of learning Jex's past actions, his hope as he stares down an innocent he means to prevent from becoming a murderer - even his child-like horror at the revelation that The Gunslinger shoots HATS! * The ending - where The Doctor gives The Gunslinger a new purpose once he has no more chance at revenge - is one of Doctor Who' most powerful. * I can't help but wonder if this script - much like Neil Gaiman's The Doctor's Wife - was originally written for Series 5 and then delayed. I say this because Rory doesn't really get anything to do in this episode, except join first the Marshall then the townsfolk in acting as a distraction. * For that matter, Amy is given little to do besides be the girl-hostage and deliver a "What The Hell?" speech to The Doctor, when he prepares to gleefully throw Jex to The Gunslinger. * What spurred The Gunslinger to dress up like an American West gunslinger in the first place? Series 7 continues it's hot-streak with this Old West tale that is just as much about The Doctor's soul and his notions of mercy and justifiable revenge as it is about cyborgs in the old west. Toby Whithouse's script comes dangerously close to hitting the audience over the head with the metaphor bat a few times but the cast manages to sell what might have otherwise been a painful episode.